Pure white silky bliss with a kick – that’s what this is. We served this on Christmas day with a standing rib roast, French green beans and a good bottle of Cabernet Sauvignon. A simple, perfect meal shared with those I love. The potatoes can be made a day ahead and refrigerated. Reheat in the microwave in 30 second intervals, stirring in between. They may need a bit more half and half for re-heating. Using the potato ricer will give a very silky texture, but you can use a potato masher, it will just not give you the same results. 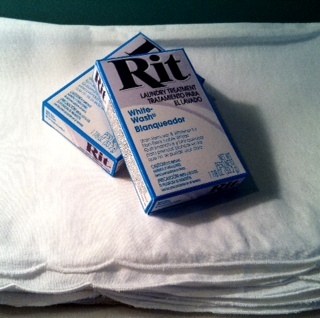 From Thanksgiving to Christmas I washed and ironed fifty-two white napkins. Lipstick, gravy, cranberry sauce, red wine and raspberries all came out. This is my go to laundry product when my whites take a beating. 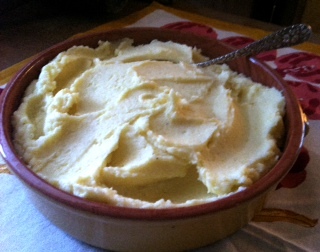 This entry was posted in Housekeeping, Recipes and tagged Horseradish, Mashed Potatoes, potato ricer, Potatoes, Rit laundry treatment, yukon gold potatoes. Bookmark the permalink.